Those who are truly privileged never doubt its existence can be taken away. Privilege to some isn't something you earn. It's what one expects. How had my family gotten here? We were never a family of secrets before, and now it seemed as if we were all hiding things. Once, when our cousin had taken a marker and drawn all over my favorite doll, Brett went after her Barbies. She went home with a bagful of ball Barbies, crying. Every once in a while it's nice to break up the (possibility) of the world ending and people fighting for their lives with a nice lighthearted contemporary. I wouldn't call Canary a lighthearted contemporary, but the synopsis grabbed my attention immediately. Especially the line about her father wanting her to stay quiet - say what now?! Things at the Franklin house have been tense for the last two years. After Kate's mom died, her father turned into himself and focused more so on the basketball team than her and her brother, Brett. They communicate with each other through post-it notes left around the house and rarely see their father, even when he is home. After coaching an amazing year at the local high school, Kate's father is offered a job at the prestigious Beacon Prep and he decides both she and Brett should attend. Kate is ecstatic and easily fits in with the "cool kids." I did have a hard time connecting with Kate's new friendships because I could see who these "cool kids" truly were from a mile away and wished I could beg Kate to run away. But while 27-year-old me saw it, I bet that 15-year-old me would have had no idea, so I can't fault Kate for just wanting to fit in. The poems scattered throughout the story enhanced my reading experience. While the story is told from Kate's perspective, the poems allow me to really get inside her head. Not just to hear her thoughts, but understand her feelings. Understand how she is dealing with the lift changing events around her. And ultimately, allow her voice to be heard. 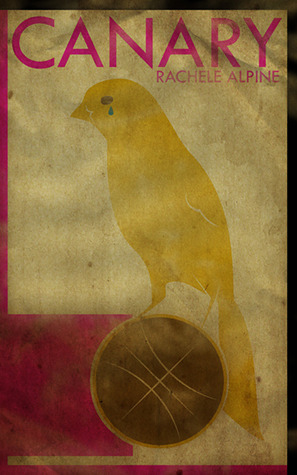 Canary is a powerful and emotional read. As things began to spiral out of control for Kate, I just wanted to hug her and tell her it would all be okay. A bonus for Rachele is that she herself is an English teacher and knows how to connect with teenage readers. She touches on many things that teenagers today deal with - family, love, friendships, peer pressure, and everyday struggles of growing up. The writing is well done and has a great flow, making Canary a quick and fun read for even the slowest and most reluctant of readers.